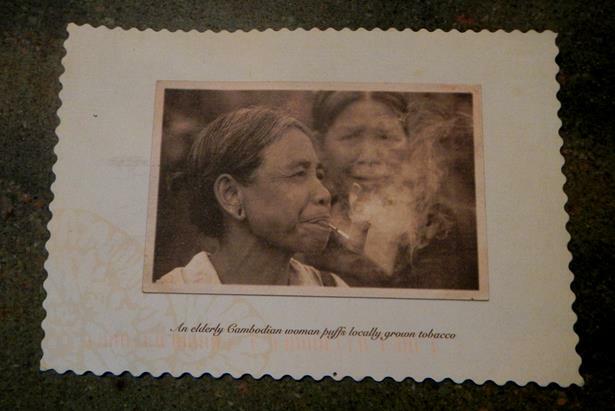 My friend Max, who works as a naturalist and photograph guide on tours around the world (this trip was up the Mekong River, stopping in Vietnam and Cambodia) sent me a postcard with an old woman smoking on the front to tell me he’s playing a game on his phone. 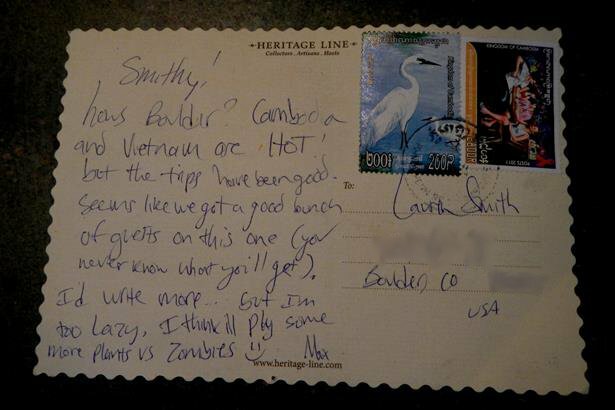 He always sends the nicest postcards. My little brother loves the Signspotting books. He owns them all. I know this, because he has shown them all to me. Repeatedly. He typically goes through phases where he is fairly obsessed with one particular set of reading and/or movie materials (sometimes there is a clear connection between the reading materials and DVDs in his stack, other times not). He’s really into series of things, like, say, all of the Star Wars movies, or Uncle John’s Bathroom Readers, or a stack of Cleveland Cavs paraphernalia and Media Guides from the past five years, from which he will regale us with various statistical tidbits, staring intently at me over his glasses, and talking as if I know anyone other than LeBron on the team– wait, he left, right? Haha, just kidding. That’s a terrible joke. I’m sorry). Anyway, the Signspotting books are on regular rotation. Over the years, I’ve seen most of them. Repeatedly, as I may have mentioned. So I started taking my own sign-spotting pictures as I traveled. And here they are. 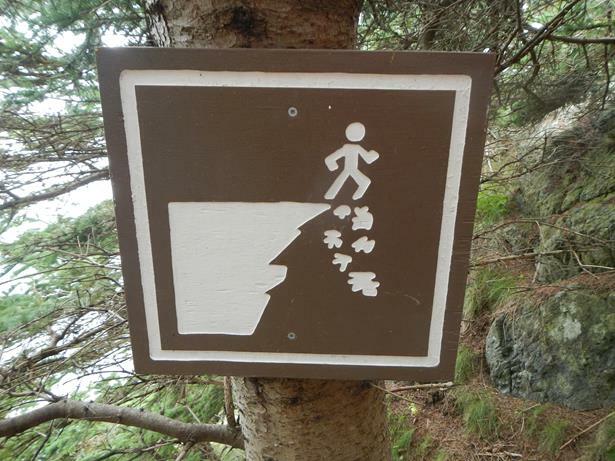 Caution: if you run enthusiastically off the cliff, popcorn will fall out of your feet. This is a gas station, somewhere in Florida, that sells fireworks. And gasoline. One stop shopping. Because I generally want to buy fireworks and diesel fuel at the same time. Doesn’t everyone? But at least there is a fire extinguisher handy. Just in case you don’t pace out those 300 feet quite right. I took this picture a few years ago, as I was driving back to Ohio from Titusville, Florida, where I had an internship at Merritt Island National Wildlife Refuge. I am alarmed that this needs to be put up as a warning on a gas station. And why only 300 feet? 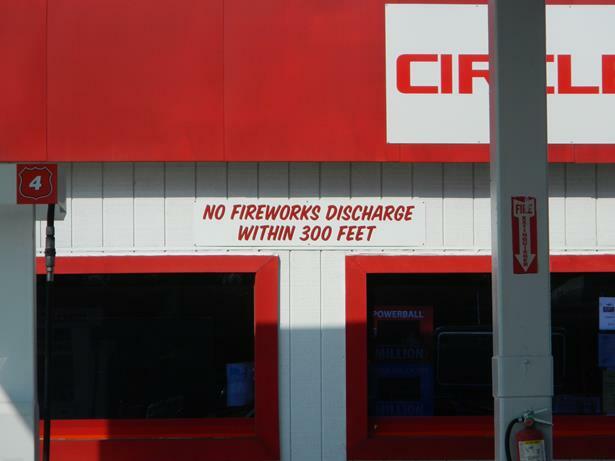 I’m fairly certain I don’t want someone shooting off fireworks 400 feet from where I’m pumping gas, let alone 300. And does that 300 feet start from the door, or from the furthest gas pump? 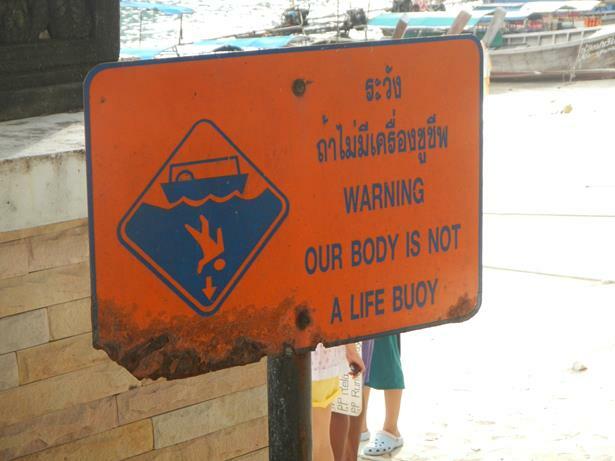 Remember, our body is not a life buoy. Because we, collectively, only have one body, and apparently it doesn’t float all that well. Also, getting run over by a boat is bad. Interpretation: It is unstable to stand on a tilty platform on the edge of a kite, because you might fall on the floating rocks. Honestly, that picture doesn’t make the bank look all that steep. That’s barely one body length. 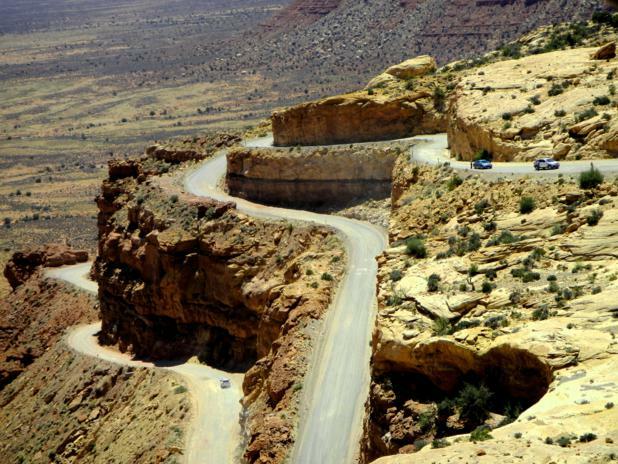 In real life, the drop is much, much, much steeper. Also, in real life you can’t even get to the edge because they put up a fence. Probably because all the tourists accidentally drive their cars off or something. This is next to the East Point Lighthouse on PEI, which is on the northeastern tip of the island. It’s all open and exposed around the lighthouse (which I was too cheap to pay to climb, because as I visited on a rainy day, I suspected the view would be similar to the one from the ground– foggy). 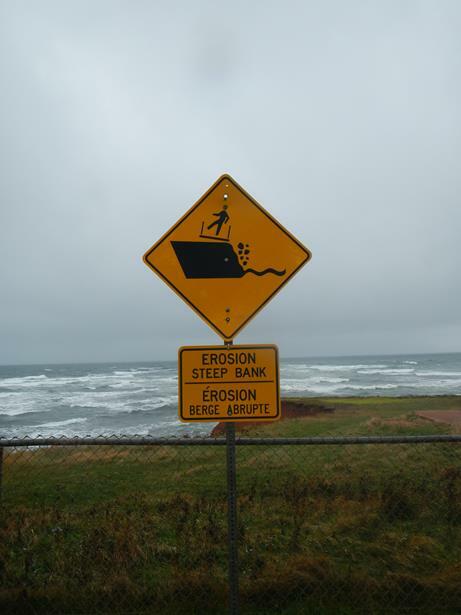 If they’re so concerned about erosion, then they probably shouldn’t put unsecured platforms on the cliff edge. Or lighthouses, for that matter. Conclusion: They are very concerned about you falling off the edges of things in Canada (see first sign). 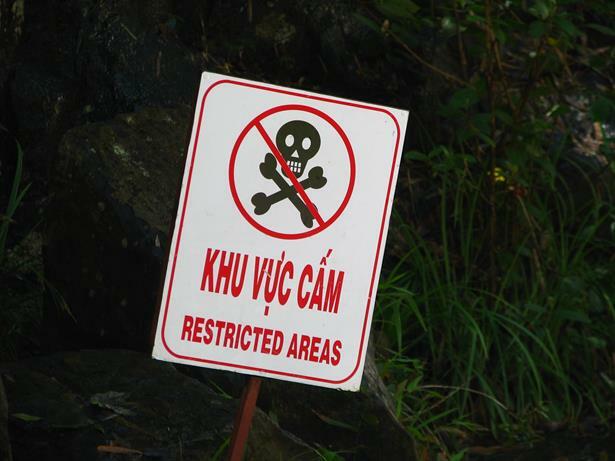 This sign was posted along the edge of the waterfall, either because the slippery rocks are dangerous and they don’t want you to fall and get hurt, or because it’s poisonous. Slightly different things. If you read neither English nor Vietnamese, I would think you’d be a little confused. Though I’m sure that if you drank the water in the waterfall you’d probably get sick, so maybe that’s what they meant. Oh, and this was the waterfall where a man dressed in an elaborate red monkey costume stuck his finger in my ear. He almost got an elbow in the jugular (since I’m taller than most Asian men, the elbow meant for his gut would have hit a bit higher), which would have definitely knocked him into the “poisonous” area behind the sign. Because where I come from, we don’t do that. I do realize that I’m a visitor to your country, and that Ohioans can be a strange breed sometimes, but there are a few core values that I refuse to compromise. Such as having foreign objects and appendages stuck in my ears. That would be a no-no. False. You will not be doing that. And there we have it. Look for part 2 coming soon! It makes me giggle every time I read it. Oh hey everyone, I’m in Canada right now. Might have forgotten to mention that… whoops. Anyway, here I am! Downtown St. Andrews. This is pretty much it, though there are a grocery store and a few more shops behind me. 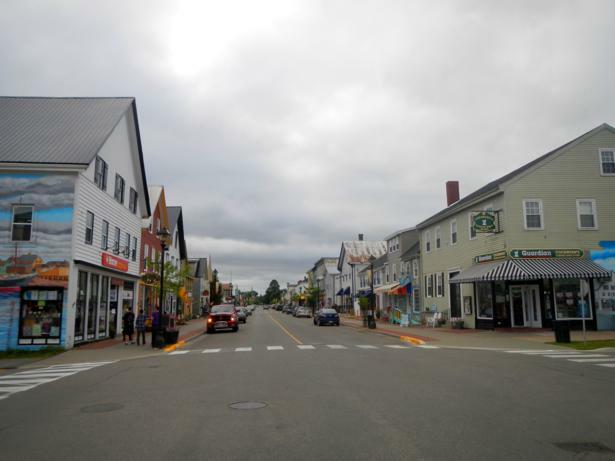 There are no traffic lights, and the main drag takes up about four blocks. It’s a very pleasant stroll along the waterfront. I’m working as a bird bander for the Huntsman Marine Science Centre, which is in the town of St. Andrews, which is in the province of New Brunswick, which is right on the Bay of Fundy, and a softball throw from the Maine border (as my mother put it). My border crossing was not quite as easy as it could have been, since apparently the paper I had explaining my purpose for coming to Canada didn’t pass muster (though it worked perfectly fine for the other bander who flew in from California, and has worked in the past.) But whatever. It was Sunday evening, they must have been bored and wanted something to do. And I really, really, really wanted to sit at the border for over an hour after driving for 8 hours that day on 4 hours of sleep. Really. After making multiple phone calls to two different people at Huntsman, who tried to explain it all to the guards (and eventually emailed them a differently-worded letter to let me get through, with the promise that it would be printed out and delivered the next day on the proper Huntsman letterhead) I was permitted to pass Go– after I paid for the $150 work visa. I don’t have a problem with this, it does make sense, but I wish they would just be consistent. Apparently this happens every year– some of the banders have no problem, others have hoops to jump through (my hoops were on fire, and I was on a unicycle). It’s easier for everyone if you have one set of rules and stick to them– and if you inform people as to what those rules are. Just sayin. 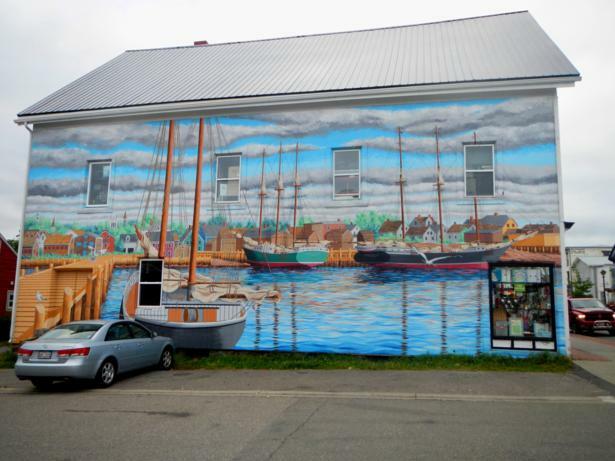 Ship mural on the side of a building in St. Andrews (if you couldn’t tell from the picture). The town is also sometimes called “St. Andrews by-the-Sea,” probably because of the proximity of the sea. During our multiple extended waiting periods (seems like just about every 10 minutes or so I’d get called back up to the desk to answer a semi-pointless question), I chatted a bit with the guy processing my papers. First, I explained a bit about what bird banding was. All he seemed to care about was that we put bands on birds. Period. He didn’t want to hear the rest of my spiel, which was slightly disappointing. I like telling people about mist nets. As he was perusing my passport, he asked, Oh, so were you working in all these other countries? Last year I spent a couple months traveling around in Asia, and I’ve been to a few places in Central and South America as well. I’m very proud of my collection of assorted visas and stamps. No, I said, I was just traveling for fun. I had a friend who had a Fulbright to study lobster farming in Vietnam and went to go visit him, and then we traveled around a bit. Nepal was my favorite, trekking in the Himalayas was amazing. Oh, well they’re not countries many people go to just for travel, he replied. I wasn’t sure how to respond to that one. Huh? I would think more people go there just to travel than to band birds. It did seem that all of the non-natives I met in Asia were there “just to travel” (other than that one weirdo studying lobsters), but what do I know, I’m just a lowly-paid field biologist. He also mentioned at one point that if they couldn’t get everything figured out I might not be able to cross the border tonight, and I didn’t want to have to drive all the way back to Ohio. Again, not sure how to respond to that one. Because I probably wouldn’t have just spent the night in Maine and tried to get across the next day, but instead I would have turned around and driven the 15 hours back to Ohio then and there. Right. 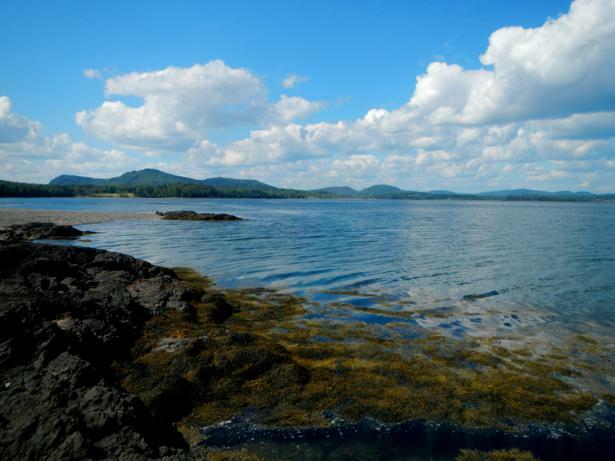 Passamaquoddy Bay, which I think rolls off the tongue quite nicely. According to Wikipedia, it was the site of a large flour smuggling operation that peaked in 1808. After American flour had its heyday, British manufactured goods and then gypsum from Nova Scotia were the smuggles of choice. (Not sure if that’s a proper way to refer to smuggled items, but it should be). I also was a little confused as to why I wouldn’t be able to cross as a visitor instead, if the powers-that-be didn’t like my paperwork. I could have signed some paper or something that promised I wouldn’t work until I got the proper forms filled out. I mean, if you can’t get a work visa, can’t you still visit the country as a tourist? I didn’t want to bring that up unless I needed to as I figured it would just complicate matters. Though it started to get slightly challenging (mostly as I was about ready to fall asleep even though the benches were extremely uncomfortable), I tried to be as pleasant and friendly as I could. They probably feel better about letting a slightly odd, chatty girl into their country than one who has been giving the death stare and monosyllabic answers for the past hour and looks like she’s ready to pass out either because she’s had no sleep or been doing recreational drugs. But I made it, and this first week has been interesting so far. I’ve seen some old familiar eastern birds that I’ve missed during my time out West, though not very many of them. We have a total of 14 nets in 2 different sites, and John and I each run a site. Mine has 8 nets, his has 6. Today, total, we caught 9 birds: John caught 8 of them, which means I had 1. My busiest day so far has been 6. We have the nets open for 5 hours each day, depending on the weather. At least I’m getting a lot of reading done- I’ve already finished one book (Bonk, by Mary Roach. I highly recommend it, though it’s a bit awkward explaining to your boss when she asks “What book are you reading?”). I still can’t get over the fact that there are no Tetons in the backyard. The ocean is okay I guess, but I’m definitely more of a mountain girl. You can’t climb on the ocean, though there are some cool birds. And in other breaking news…. Happy Birthday to my fabulous Mother Dearest! 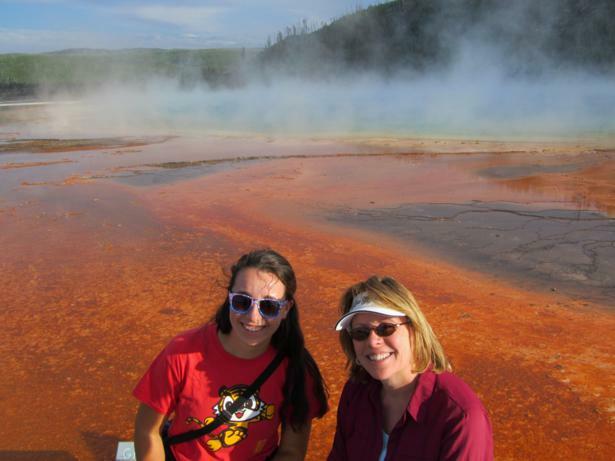 Grand Prismatic Spring, Yellowstone National Park, 2012. 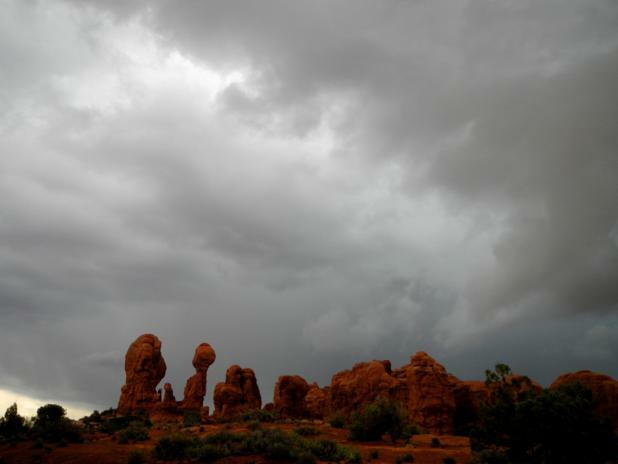 We are driving through Arches National Park, and it’s raining. There are big flashes of lightning here and there, but I can’t hear if there is any thunder. The car windows are rolled up against the rain. The gray clouds and sky make a different backdrop, one I like better than the normal clear blue skies. There is more emotion, more drama. This is what this place stirs in me, varied emotion, varied feelings, the gray mottled churning of the sky. This place is not as simple as a cloudless bright blue sky. Max getting ready for sunset by gazing into the sky, in the wrong direction. The sun sets over the bend in the river, straight across from where we stood on the rim. 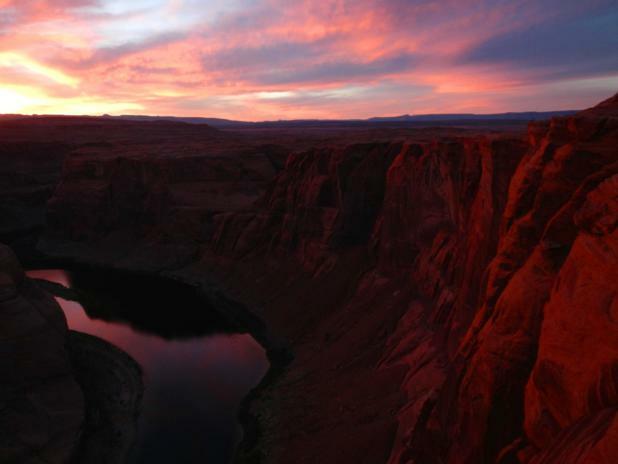 We spent about a day in Page, Arizona, saluting the day both at its end and beginning from the rim of Horseshoe Bend, a “horseshoe-shaped meander of the Colorado River.” We made the mile-long trek to the edge of the canyon rim, overlooking the water below by about 1,000 feet. There are no railings, so you are left with only your own common sense to protect you from going over the edge. 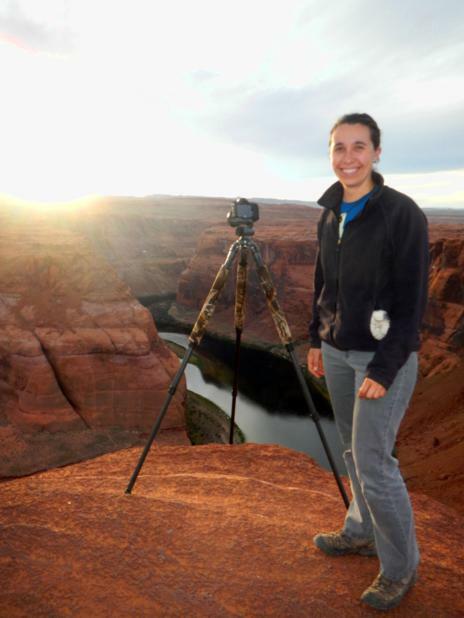 Pretending to be a photographer, and being very careful not to stumble and knock the tripod over the canyon rim. It’s windy here on the rim of Horseshoe Canyon, and the wind blows sand in our faces, camera lenses, and down one thousand feet to the river below. I can see the wind ruffling the surface of the water. 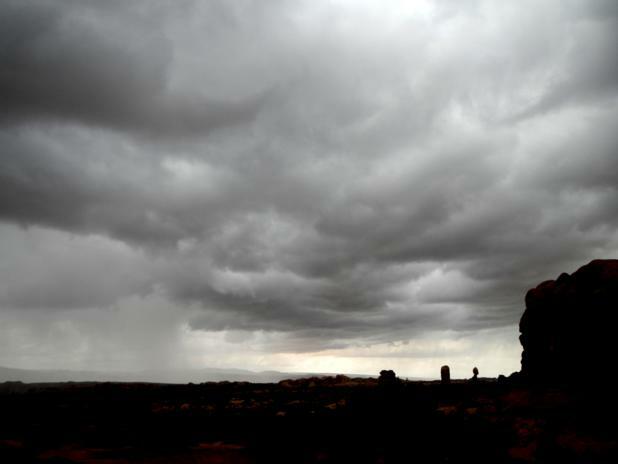 It’s not really cold, just when you’re sitting still the wind gets to you, blowing your warmth away across the desert. The sunset tonight was all a photographer could ask for, streaks of pink clouds, blues and purples, orange. 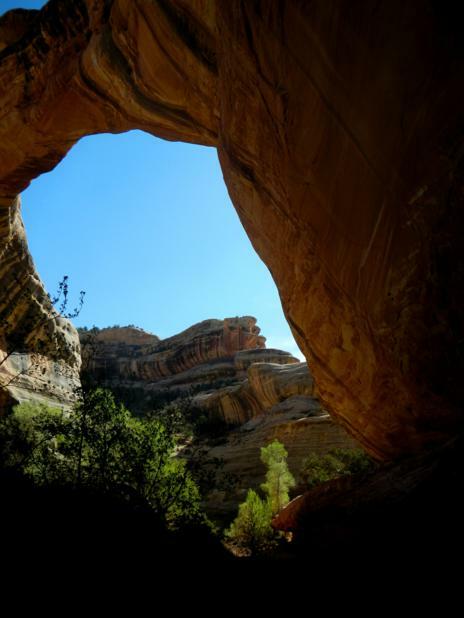 I hear violet-green swallows flying below me along the canyon walls, and lower still I see a soaring raven, which from my perspective looks the size of an ant, an ant with a paraglider. Some of the people who joined us to watch the sunset. 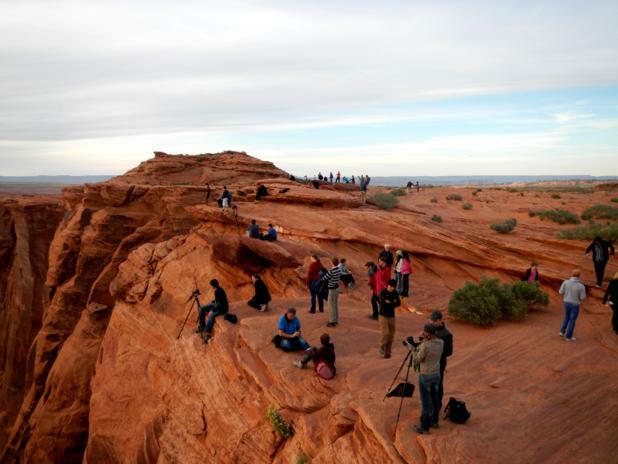 After I took this picture, more people arrived, until there were at least 100 total loitering on the canyon rim. I’m sitting on the edge, much closer than Mom would be comfortable with, my left foot braced parallel a few inches from the edge, the rest of me a couple feet back, no danger of losing my balance. The wind isn’t that strong. As the sun goes down, the people leave with the light. I try to eavesdrop, but most of them speak different languages and I don’t know what they say. They don’t seem to be speaking of the view though, because those who really look don’t say anything. 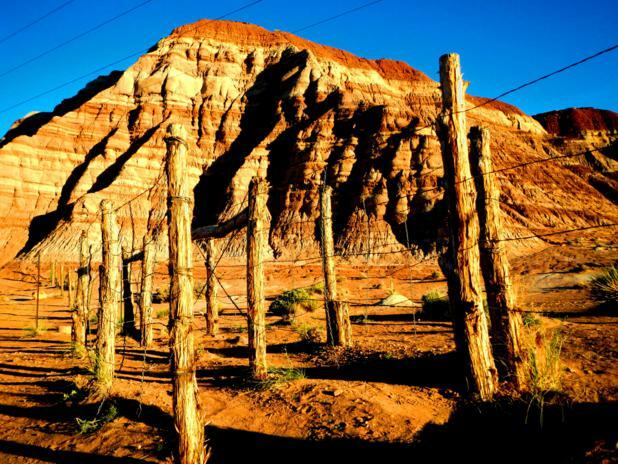 The canyon walls glowed a beautiful orangish/red in the vanishing sunlight, a living color that to me is the essence of this place. 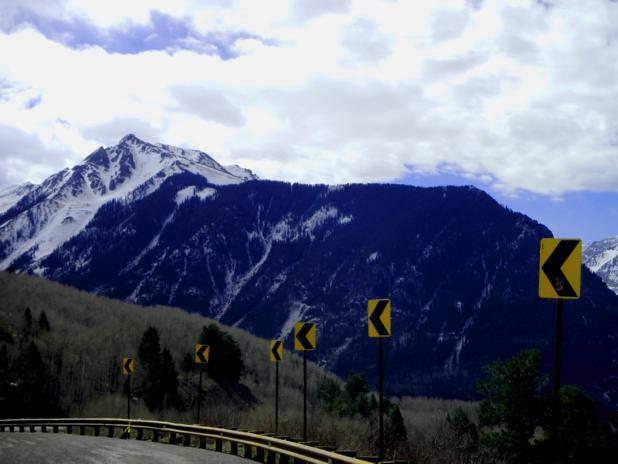 We left Boulder Sunday evening, and drove up to Aspen, where we camped for the night. Slightly chilly. From there, we went to Black Canyon of the Gunnison National Park (where Max discovered he had left his national park pass at home on the dresser) and then on to Telluride. From Telluride, we headed to Natural Bridges National Monument in Utah for some star photos, and then this morning made our way to Mule Canyon, to take pictures of the House on Fire ruins. 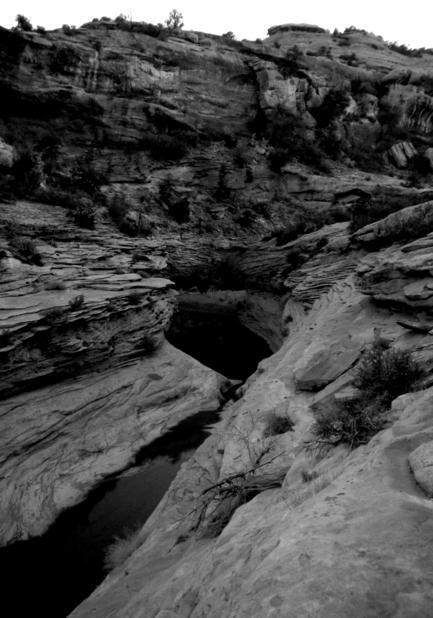 The ruins are in a little canyon out in the desert, and it was fun to poke around and explore. From there, we drove down here to Page. 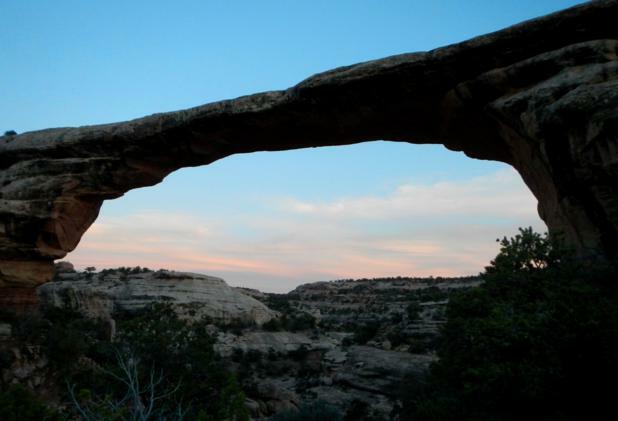 So tonight and I think tomorrow we’re here in Arizona, and then we continue our loop northward, heading back to Utah and hitting up Zion, Bryce, Arches, Canyonlands National Parks, as long as we don’t run out of time. We don’t have to be back in Boulder until May 11th, so we have plenty of time. Give my Bogie-dog a big back scratch and an extra cookie from me!